For all of you lovers of the underwater world, I’m pleased to share that a book I photo edited for National Geographic on the world’s best scuba diving locations is now in bookstores! 100 Dives of a Lifetime is written by Carrie Miller, a friend and colleague I last collaborated with on a project for Tourism New Zealand. While photo editing over the course of a year on this title, my eyes feasted on imagery from 100 locations around the world, both above and below the surface. At times finding images from these remote destinations was elusive, like digging for underwater treasure. Luckily, with the contributions from the libraries of many talented underwater photographers, the treasures are now on display in the pages of this beautiful book. Working on a book is a long process that involves extensive collaboration with editorial and design teams and a huge amount of organization. Thank you to author Carrie Miller (who is currently working on another travel book relating to scuba diving!) and Moira Haney, Allyson Johnson, and Sanaa Akkach at National Geographic Books. After working on this project, I took away an urgency to get myself scuba-certified, a deep appreciation for the art of underwater photography, and an obsession with nudibranchs. Pick up a copy of 100 Dives of a Lifetime here. And stay tuned for another book that I’m about to wrap up in National Geographic’s “Of a Lifetime” series, one which won’t require dive fins! If you were in a book or grocery store lately, you may have seen the cover of this magazine inviting you to change your life. Indeed, this”book-a-zine” (bigger than a magazine, smaller than a book), changed my life for quite a while last summer as I photo edited images for all of the amazing destinations held within its pages. It had only been a couple of years since leaving my staff job at National Geographic Traveler as a photo editor and it felt great to work on 100 Places That Will Change Your Life. And, as always happens when working on these projects, my list of travel destinations has grown with priority now being given to a culinary trip to Oaxaca, a trail-restoring trek to Torres del Paine, and a trip to see turquoise waters in Croatia. 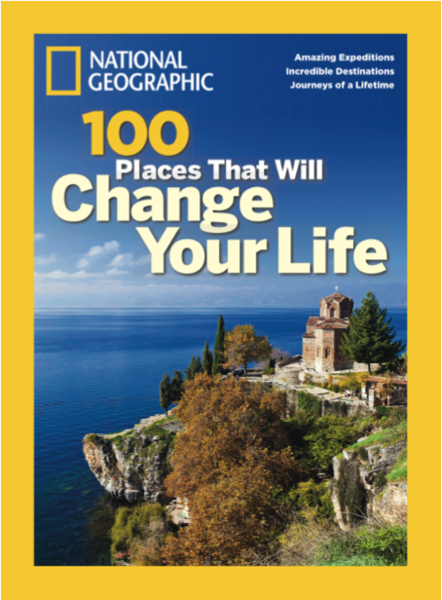 If you need a little travel inspiration and you missed this publication, you can order a copy via National Geographic here.